Maneka Gandhi had no inhibitions about making an outrageous speech before her Muslim constituents. This arrogance needs to go. How must one react to Maneka Gandhi’s address before her Muslim constituents? In a video, one that has gone viral, she is seen calmly addressing a bunch of Muslim men. She claims to have already won the election with the love and affection of the people of her constituency. Polling is yet to take place. But the leader is confident that she has already won. So great is her confidence that she doesn’t raise her voice or sound bitter or threatening at all while telling Muslims that they have little option aside from voting for her. She would win, she claims, with or without them. But with their votes, the victory would be sweeter. Logon ke pyaar se mein jeet rahin hun lekin agar meri jeet Musalmaanon ke bina hogi toh mujhe bahot accha nahi lagega kyunki itna mein bata deti hun ki phir dil khatta ho jata hai. Phir jab Musalmaan aata hai kaam ke liye phir mein sochti hun ki nahi rehne hi do, kya fark padta hai. Akhir naukri ek saudebaazi bhi toh hoti hai. Baat sahi hai ki nahi? Aisa nahi hai ki hum sab Mahatma Gandhi ki aulaad hain, ki bass dete hi jaayenge aur elections mein maar khaate hi jaayenge. Ye jeet aapke bina bhi hogi, aapke saath bhi hogi. Aur ye cheez aapko sab jagah phailaani padegi…Samajh gaye aap log? She is confident about winning, but not about whether Muslims would help propel her towards the victory that is required to send her to the parliament. If they don’t vote for her, she would not feel good. Would they be helpful enough to not deprive her of this good feeling? She further adds that Muslims should expect nothing from her if, after the votes of the booths in the Muslim localities are counted, and she discovers that they have not supported her. There is some semblance of doubt lurking behind her words when she says that she will win, with or without Muslim votes. This doubt is about the Muslims’ support for her. They may not be a part of the victory march, she feels. Ideally, she should introspect as to why a particular section of the electorate is not inclined to vote for her. After all, she is a nice person, ready to fight for the rights of all in the animal kingdom who have nothing to do with her. They have no voting rights. They don’t give her anything in return. Yet, she champions their rights without seeking anyting in return for the favours she bestows on them. Why then, does her benevolence vanish before a section of the homosapiens, also known as Muslims? Did she ever consider that maybe, her association with a party – whose raison d’etre is hatred – is what has alienated the Muslim community? Perhaps they are wary of her goodness because they believe her party thrives on demonising Muslims and Christians? Having heard the speeches of the president of the party and the prime minister, which gleefully stoke anti-Muslim hatred, they are not convinced. They know, despite their illiteracy, that her party is doing everything possible to disenfranchise them in all spheres of their lives. It is this party which has decreed that Muslims are ‘latecomers’ to this nation and therefore have lesser rights over it, as infiltrators, conspirators who have resolved to outnumber Hindus and turn India into an Islamic country. Also, unlike her, they may be quite aware that the general election is not about choosing someone who would fix their municipal problems but to elect people who would act responsibly while making laws. It is to ensure that there are lawmakers in the parliament who will thwart the passing of laws like the Citizenship Amendment Act and the Triple Talaq Act. It is to ensure that there are enough lawmakers who will foil any attempts made to change the fundamental character of India’s relationship with Kashmir. That there are conscientious lawmakers who will safeguard the interests of the weaker sections of the county against the rich and powerful who always steal the mandate of the people. Maneka Gandhi should have talked about her record as a lawmaker – about how she stood for the rights of the deprived and the minorities, how she has helped in the enactment of good laws. Instead, she spoke like a street bully, a blackmailer – as if voting was all about give and take, and that all she would do was sign and forward requests for admissions to the central school or Navodaya Vidyalaya, but only for those who have actually voted for her. It is a trade-off. Maneka Gandhi actually says it. That is a “sauda”, a trade-off. “Is not it?” She asks plainly. She is also aware of her limits: she cannot be taken as the sixth progeny of the Mahatma who would continue giving without any expectations. Goodness is not my ideal, she accepts. She made me remember those mohalla dadas who used to say, “Main bahut bura adami hoon, yad rakh”. Maneka Gandhi is confident that this brashness will go unchallenged as she is before a timid audience. Would she be as plainly courageous before the Hindus if she knew that not all Hindus would vote for her? Would she ever think of proposing this deal before a section of doubtful Hindu voters? Some people think that the kind lady was threatening Muslims. She claims being misquoted, that actually she spoke with affection. That the audience did not react adversely also proves that it has understood the real message of her affectionate expectation from them. It has a motherly tinge to it, she feels. 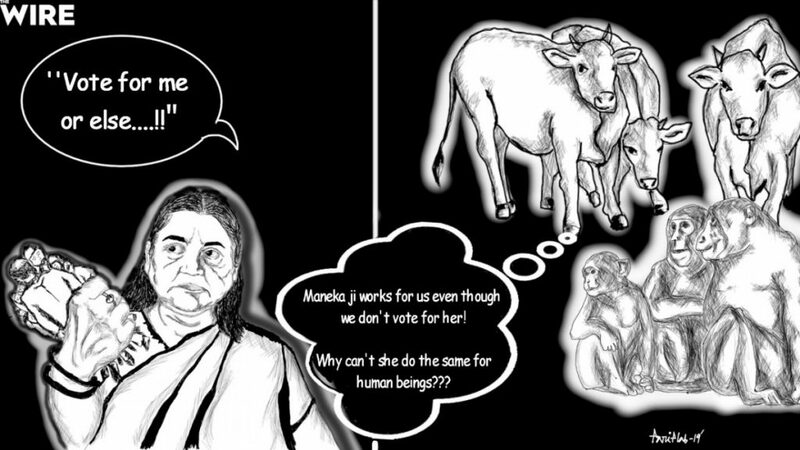 Poor Maneka Gandhi has only her foundation’s funds and her MPLaD to lure or scare her people into voting for her. But another gentleman, Sakshi Maharaj – a self-declared holy man – is also not confident about the support from people of his faith. So, like Duravasa, he threatens them with a curse. This speech should have been, in normal circumstances, sufficient to disqualify Maneka Gandhi. But we know that we are living in extraordinary times. Maneka Gandhi has no inhibitions about making such outrageous speeches. This arrogance must go. These people must be brought down to the earth, for them to realise that they are servants of the people and not their lords. 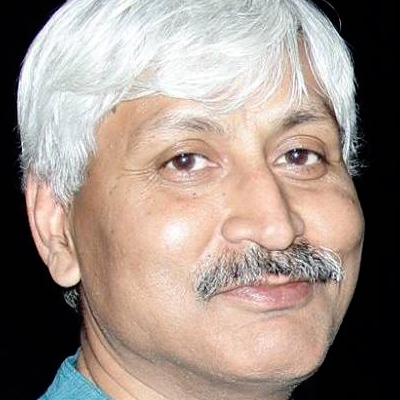 Apoorvanand teaches at Delhi University.